If you’re afraid of eating raw kale, don’t be. I’m here to rescue you with my kale avocado salad! The secret is a sea salt massage. For the kale, not you! It’s a superfood after all, and it deserves your love and attention. Massaging the leaves makes it less tough and much more enjoyable to eat. You won’t believe the difference in taste and texture! Truth is, the more you eat dark leafy greens the more your body will crave them. This luscious kale and avocado salad will get you eating your greens without complaining. 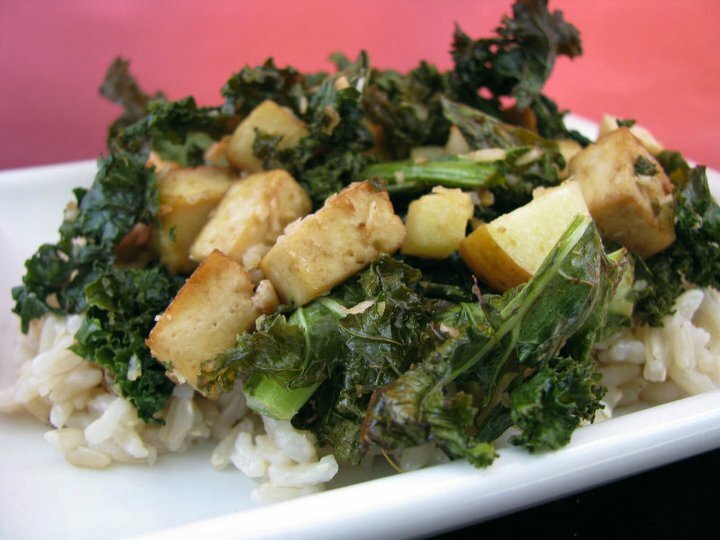 You might even convince your friends to become kale-lovers, too! This hearty kale avocado salad is bursting with flavor from a simple dressing of olive oil, lemon, garlic, and dijon. It really hits the spot on those days you’re craving greens! Massage the finely chopped kale in a large mixing bowl with 1/4 teaspoon of sea salt with your hands until wilted and deeper green in color. This takes about 2 minutes. Add red onion, avocado, currants, pumpkin seeds, vegan parmesan (reserving some for the top), and ground black pepper to the kale and toss until well combined in all of the dressing. Serve immediately! The salad keeps well for 1 day in the fridge even with dressing on it, but it's best eaten immediately. I’m on this Kale movement! I read about in In Style – I’m gonna try out your recipes! This was good! I added some chopped up chick’n strips for something extra and it was a great post-run meal!